A small, easy to move, 0 gauge layout to fit our new location. The warped backscene ply has been replaced with thicker ply, but needs a new scene attached with the low relief buildings. The crossing at the right hand end of the platform has been reversed, hopefully this will make operating the layout easier. 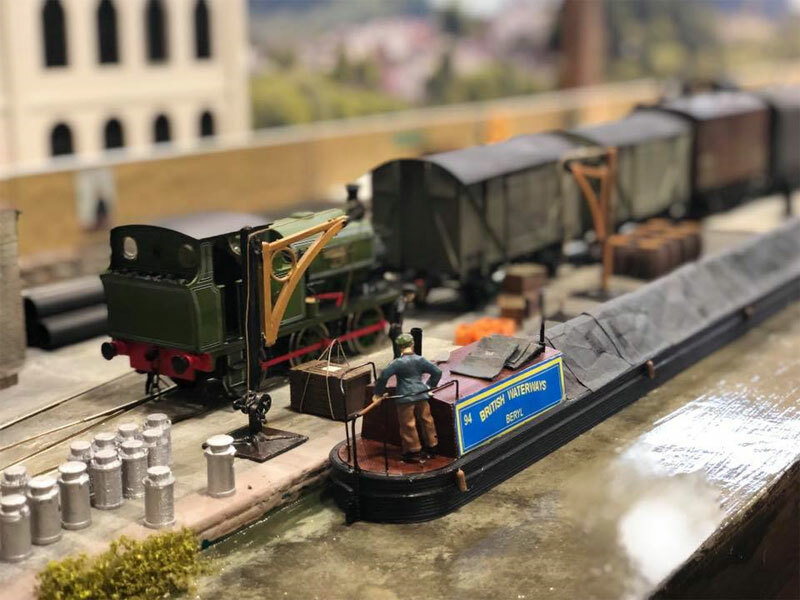 A goods shed has been built at the right hand end of the layout, with a road crossing and some minor alterations to the sidings. 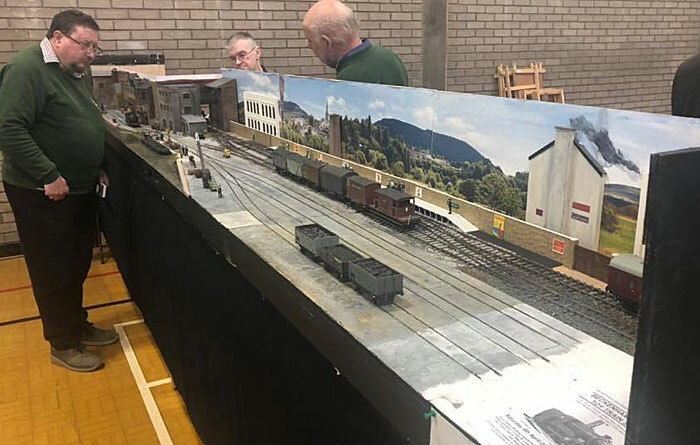 Photos of the layout on 2 Dec 2018 at the Bexleyheath Model Rail Show. 4 baseboards, 4ft x 2ft. 12in tall backscene. So 2ft x 18in endboards. Needs 2ft x 3ft floorspace in the shed when stored on end. Finescale 2 rail DC or DCC. Work as a test track, with long straight track, 6 ft curves, and 5ft curves in the goods yard. Be small enough to store in the shed, and fit in 1 car. Erect or pack in under 15 mins so we can use it in an evening. Minimise the number of separate parts, adjustable legs fold out to reduce set-up time. Light weight so easy to move into the shed or a car. Passenger trains: up to 2 coaches plus a loco, push pull or multiple unit. 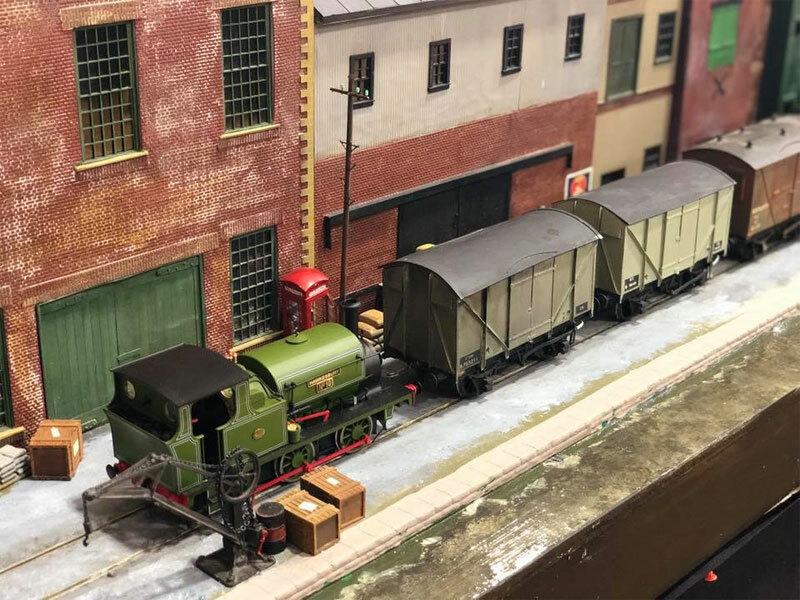 Goods trains: at least 5 goods wagons, a brake van, and a loco. Good enough to take to shows and St. George's church craft fair. Cassettes, 18 inch cassettes for locos, 39 inch cassettes for stock, in 5ft of fiddle yard space. Trains up to 4 ft 9 inches (scale 200ft), the length of loco is limited by the run round to about 490mm (70ft). Blue area is the canal. Dark blue area is the platform. Yellow area is fiddle yard behind warehouses as it's a quayside. Brown areas are buildings, mostly in low relief. Cyan is lever frame for points and a ground frame for shunting. Points operated by r/c servos. Operate from back at shows, from front for shunting. 16 ft long for test track either straight or with curves. Needs 7 points, approx 16 yards of track. A quick explanation: There are 3 sidings, 8 wagons, 1 loco, you have to form a train of 5 wagons, with limited siding and headshunt length. The sidings can have at most 5 wagons on one siding, and 3 wagons in the other two. The headshunt to the long siding can hold a maximum of 3 wagons plus the loco. (We will have to have marks to show the limits as the sidings are longer.) We need 8 different easily recognised wagons (Private Owner wagons or different loads in wagons ?). Set in a fixed starting position with 5 in the long siding and 3 in one of the short sidings. Also a small shunting loco. Shuffle the 8 cards with wagon pictures, pick 5 cards in order of the train to be made up, (6720 possible combinations). Form the train in the minimum number of shunting movements. Some pictures taken after laying the track and wiring it up, before paving the quayside and doing the rest of the scenery.